Frustrated cat owners in Guernsey are hopeful the island's feline shortage is about to come to an end. A consignment of 21 cats has been brought in from the Worthing and District Animal Rescue Centre in West Sussex to help solve the problem. A successful neutering campaign has resulted in too few kittens on the island to meet demand for pets. The new additions include four young tom cats, whose job is to boost island kitten numbers. Pet owners have been so vigilant about spaying and neutering, the island is now suffering a kitten shortage. Since 2000 the number of cats being taken in by the Guernsey Society for the Protection of Animals (GSPCA) each year has fallen from 1,000 to 100. And that is leaving many of the island's cat lovers disappointed in the search for a new pet. Jayne Le Cras from GSPCA says the story of the shortage has obviously been picked up on the internet and appears to have gone worldwide. She said: "The Worthing and District Animal Rescue Centre were told about its by somebody in Scotland, who'd heard about it from someone in the States. "Obviously we're delighted to oblige. "Over the past 20 years we've being trying to promote responsible pet ownership by encouraging spaying and neutering. "But in a way, we've become victims of our own success." The spaying campaign was started in 1999 by the founder of the Guernsey Animal Aid animal charity, Sue Vidamour. "We still advise people to be very careful, because we don't want to go back to having many litters of unwanted kittens or puppies. "I think it's probably at the vets, where if the vet sees a very nice, healthy specimen of animal coming in, he will be the one to perhaps broach the subject with the clients to see if they'd consider letting the cat have a litter of kittens." The GSPCA says it is a great result for everyone - cat lovers in Guernsey, the Worthing and District Animal Rescue Centre, and most importantly the cats. A spokesperson for the Guernsey shelter says 12 of the cats had already been given new homes. 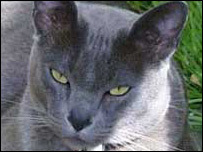 There are plans for another 60 cats to be shipped to Guernsey before Christmas.